The Blue Brain Project, the simulation core of the European Human Brain Project, released today (Oct. 8) a draft digital reconstruction of the neocortical microcircuitry of the rat brain. The international team, led by Henry Markram of École Polytechnique Fédérale De Lausanne (EPFL) and funded in part by the Swiss government, completed a first-draft computer reconstruction of a piece of the rat-brain neocortex — about a third of a cubic millimeter of brain tissue containing about 30,000 neurons connected by nearly 40 million synapses. The electrical behavior of the virtual brain tissue was simulated on supercomputers and found to match the behavior observed in a number of experiments on the brain. Further simulations revealed novel insights into the functioning of the neocortex. The simulation reproduced a range of previous observations made in experiments on the brain, validating its biological accuracy and providing new insights into the functioning of the neocortex. The project has published the full set of experimental data and the digital reconstruction, in a public web portal, allowing other researchers to use them. A long-awaited open-access paper (available online until Oct. 22) describing the digital reconstruction was published today by the journal Cell. The reconstruction represents the culmination of 20 years of biological experimentation that generated the core dataset, and 10 years of computational science work that developed the algorithms and built the software ecosystem required to digitally reconstruct and simulate the tissue. Some scientists see the 36-page paper as proof that the idea of modeling a brain and all of its components is misguided and a waste of money, Science magazine reports. “There is nothing in it that is striking, except that it was a lot of work,” says Zachary Mainen, a neuroscientist at the Champalimaud Centre for the Unknown in Lisbon. While a long way from the whole brain, the ambitious and controversial Blue Brain Project study demonstrates that it is feasible to digitally reconstruct and simulate brain tissue … a first step and a significant contribution to Europe’s Human Brain Project (which Markram founded), according to a statement by EPFL. The study was a massive effort by 82 scientists and engineers at institutions in Switzerland, Israel, Spain, Hungary, USA, China, Sweden, and the UK. The researchers performed tens of thousands of experiments on neurons and synapses in the neocortex of young rats and catalogued each type of neuron and each type of synapse they found. They identified a series of fundamental rules describing how the neurons are arranged in the microcircuit and how they are connected via synapses. According to Michael Reimann, a lead author who developed the algorithm used to predict the locations of the nearly 40 million synapses in the microcircuitry, “The algorithm begins by positioning realistic 3D models of neurons in a virtual volume, respecting the measured distribution of different neuron types at different depths. 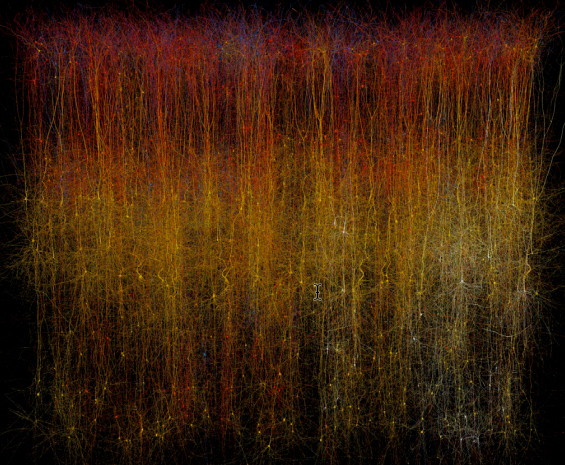 It then detects all locations where the branches of the neurons touch each other — over 600 million. “It then systematically prunes [deletes] all the touches that do not fit with five biological rules of connectivity. That leaves 37 million touches.These are the locations where we constructed our model synapses.” To model the behavior of synapses, the researchers integrated data from their experiments and data from the literature. “It is big step forward that we can now estimate the ion currents flowing through 37 million synapses by integrating data for only a few of them,” says Srikanth Ramaswamy, a lead author. Researchers found a close match between connectivity statistics for the digital reconstruction and experimental measurements in biological tissue, which had not been used in the reconstruction, including measurements by researchers outside the project. Javier DeFelipe, a senior author from Universidad Politecnica de Madrid (UPM), confirms that the digital reconstruction compares well with data from powerful electron microscopes, obtained independently at his laboratory. Idan Segev, a senior author, sees the paper as building on the pioneering work of the Spanish anatomist, Ramon y Cajal from more than 100 years ago. “Ramon y Cajal began drawing every type of neuron in the brain by hand. He even drew in arrows to describe how he thought the information was flowing from one neuron to the next. Today, we are doing what Cajal would be doing with the tools of the day — building a digital representation of the neurons and synapses and simulating the flow of information between neurons on supercomputers. Furthermore, the digitization of the tissue allows the data to be preserved and reused for future generations.”. The aim of the study was to create a digital approximation of the tissue. The big test is how the circuit behaves when the interactions between all the neurons are simulated on a supercomputer — an enormous challenge for the project’s engineers and scientists. As reported by Felix Schürmann, a senior author who leads the team that builds the sofware to run on supercomputers: “Building the digital reconstructions, running the simulations and analyzing the results required a supercomputing infrastructure and a large ecosystem of software … [to] solve the billions of equations needed to simulate each 25 microsecond time-step in the simulation”. Simulations also helped the team to develop new insights that have not yet been possible in biological experiments. For example, the Cell paper describes how they uncovered an unexpected yet major role for calcium in some of the brain’s most fundamental behaviors. Eilif Muller, a lead author, describes how early simulations produced bursts of synchronized neural activity, similar to the activity found in sleep and very different from the asynchronous activity observed in awake animals. “When we decreased the calcium levels to match those found in awake animals and introduced the effect that this has on the synapses, the circuit behaved asynchronously, like neural circuits in awake animals.” Simulations integrating these biological data revealed a fundamental role of calcium in controlling brain states. The researchers found that there are, in fact, many cellular and synaptic mechanisms that can shift the circuit from one state of activity to another. This suggests that the circuit can change its state to enable different computing capabilities. If this is so, it could lead to new ways of studying information processing and memory mechanisms in normal brain states, such as wakefulness, drowsiness, and sleep and some of the mechanisms in abnormal states such as epilepsy, and potentially other brain disorders. Now that the Blue Brain team has published the experimental results and the digital reconstruction, other scientists will be able to use the experimental data and reconstruction to test other theories of brain function. * One such simulation examined how different types of neuron respond when the fibers coming into the neocortex is stimulated by incoming fibers, analogous to touching the skin. The researchers found that the responses of the different types of neurons in the digital reconstruction were very similar to those that had been previously observed in the laboratory. They then searched the reconstruction for exquisitely timed sequences of activity (“triplets”) in groups of three neurons, that other researchers had previously observed in the brain. They found that the reconstruction did indeed express the triplets and also made a new discovery: the triplets only occur when the circuit is in a very special state of activity. They further tested whether the digital reconstruction could reproduce the recent discovery that some neurons in the brain are closely synchronized with neighboring neurons (“chorists”), while others operate independently from the group (“soloists”). The researchers found the chorists and soloists, and were also able to pinpoint the types of neurons involved and propose cellular and synaptic mechanisms for these behaviors. We present a first-draft digital reconstruction of the microcircuitry of somatosensory cortex of juvenile rat. The reconstruction uses cellular and synaptic organizing principles to algorithmically reconstruct detailed anatomy and physiology from sparse experimental data. An objective anatomical method defines a neocortical volume of 0.29 ± 0.01 mm3 containing ∼31,000 neurons, and patch-clamp studies identify 55 layer-specific morphological and 207 morpho-electrical neuron subtypes. When digitally reconstructed neurons are positioned in the volume and synapse formation is restricted to biological bouton densities and numbers of synapses per connection, their overlapping arbors form ∼8 million connections with ∼37 million synapses. Simulations reproduce an array of in vitro and in vivo experiments without parameter tuning. Additionally, we find a spectrum of network states with a sharp transition from synchronous to asynchronous activity, modulated by physiological mechanisms. The spectrum of network states, dynamically reconfigured around this transition, supports diverse information processing strategies.